This is a bit different and perfect when you’ve got over the initial excitement of new potatoes and feel like doing something other than steaming them and covering them with butter. 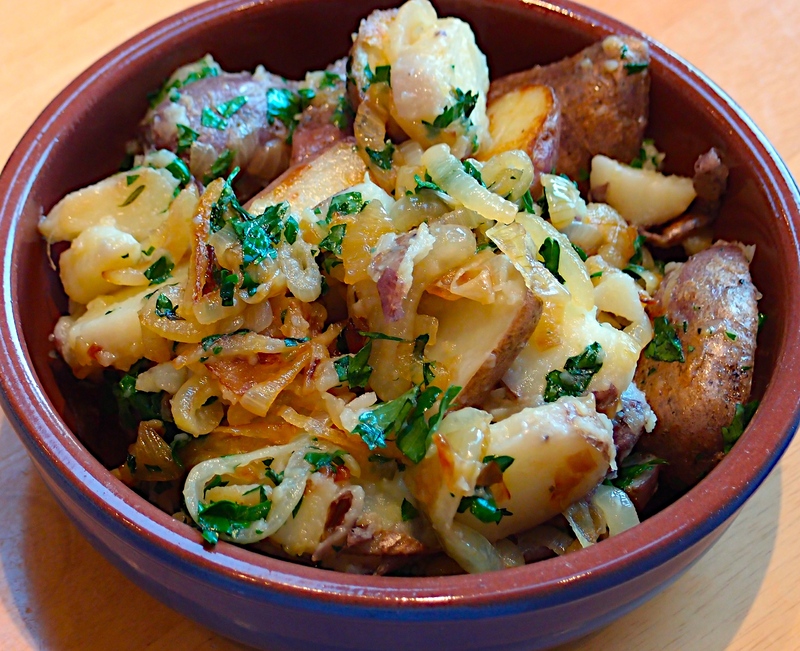 Jersey Royals are nice if you can find them. We served these with some salmon and herby mayonnaise. Heat oven to 240C/Fan 220C/Gas 9. 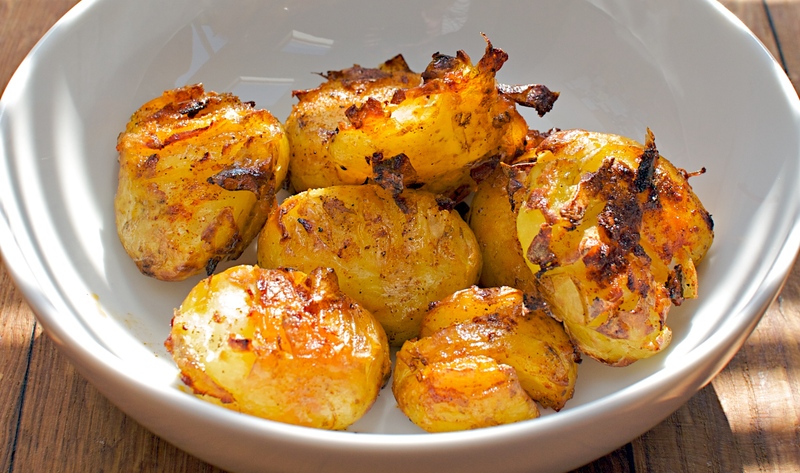 Boil the potatoes until almost cooked – about 12 minutes. Drain, then slice and put into a large bowl. Tip in the capers, olives and herbs, then add most of the olive oil and season. Gently mix together, lightly crushing the potatoes as you go. Line a medium Swiss roll tin with baking parchment, leaving some overhanging. Tip the potatoes into the tray and spread to flatten. Mix the vinegar with the rest of the oil and drizzle over. Bake for 40 minutes or until crisp and golden. Nothing beats minty new potatoes. We like to make this in May when the Jersey Royals arrive and the promise of summer is just around the corner but of course it’s good all summer long. Put the potatoes in a pan of salted water and bring to the boil. Simmer for about 15 minutes or until tender, then drain and put into a bowl with the French dressing and leave to cool. Mix the mayonnaise, yoghurt and mint together and toss with the potatoes. Season really well with salt and pepper. French Dressing: Blend 200ml red/white wine vinegar, 200ml extra virgin olive oil, 400ml sunflower oil, 1 garlic clove, peeled and finely chopped, 3 tbsp wholegrain mustard, and 1-2 tbsp honey and season with salt and pepper. This makes 800ml of dressing and will keep in the fridge for a few weeks. We made this back in June when local asparagus was available, but have been very lax getting posts up on the blog (must do better!). We really enjoyed the combination here and the addition of our own, home-grown mint, dill and chives really made the dish sing. Simmer the potatoes in lightly salted water, with the mint, until tender. Drain over a bowl and reserve the cooking water. Return the potatoes to the pan with the butter, stir together and keep warm. For the sauce, use a large shallow stainless steel or enamel saucepan and squeeze in the lemon juice. Add 6 tbsp of the potato cooking water and the sugar, then simmer until reduced by half. Slowly incorporate the butter, a chunk at a time, whisking over a very low heat until homogenous (you’re aiming for a light butter sauce). Season with white pepper and keep warm. Peel the asparagus tips from just below the bud and slice in half lengthways. Add to a pan of boiling well-salted water and boil for about 1-2 minutes – you want them just tender but not raw, then drain. Slice the warm potatoes and add them, along with the asparagus, to the butter sauce. Turn gently with the chives, until everything is nicely coated. 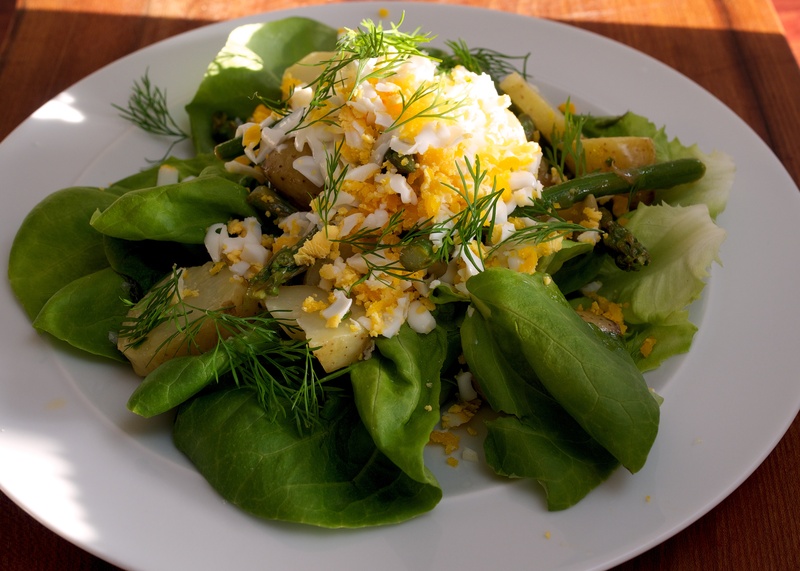 Arrange the lettuce on 4 plates and divide the asparagus and potatoes between them. Sprinkle with Maldon salt and grate over the egg. Generously scatter with the chervil or dill. A weeknight treat to celebrate the new season’s bounty. Wine Suggestion: We had a glass of the Domaine St Denis Macon-Lugny, a superb chardonnay from the Mâconnais in Burgundy and from the only grower-winemaker in this village (the rest goes to the co-op). Excellent flavours and a nutty depth marry well with the fresh, new season flavours and roasted chicken; a good choice. Put the potatoes, asparagus, garlic cloves and olive oil into a large roasting tray and season well. Squeeze over the juice from the lemon halves, then cut into chunks and add to the tray. Toss together well, cover with foil and roast for about 15 minutes. Remove the foil and stir through the rosemary. 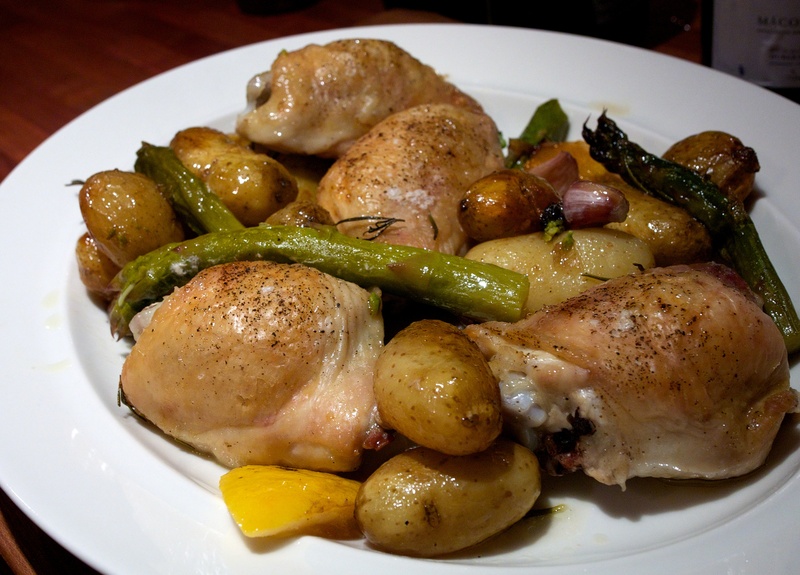 Season the chicken thighs and arrange in the dish in a single layer. Now roast for 30-50 minutes or until the potatoes are tender and the chicken is crisp and cooked through (this will depend on the size of your potatoes and chicken thighs). My Dad keeps talking about these potatoes that I made before which he says I squashed a bit and then put them in the oven to crisp up. I had no recollection of these squashed, crispy potatoes until I came across these. Is this them Dad? If so I’ll make them for you next time I see you. Heat oven to 200C/fan 180C/gas 6. Boil the potatoes for 10 minutes, drain and then put back on the warm ring to dry off. Spread the potatoes out on a baking tray and squash them a bit using a potato masher. Be careful here as you only want them a bit squashed and not completely smashed (though I smashed one or two and it just made them even more crispy so don’t worry too much). Drizzle with the olive oil and sprinkle over a little paprika, salt and pepper. Now roast in the oven for about 20 minutes or until nice and crispy. We like leftovers and at the same time we don’t cause it means we don’t get to cook anything new for dinner. Our way around this is to cook some tasty side dishes which we often neglect in favour of the main event. We picked up some new season ‘blue danube’ potatoes, carrot, chard (or Silverbeet as Jono would say), and onions at the market on Sunday and made two tasty treats to brighten up the leftover peposo (see post below). Heat the butter in a shallow pan and cook the onions on low, with the thyme and bay leaves, for 20 minutes or until very soft. Turn the heat up to medium and cook for another 5 minutes or so to make the onions golden and sticky. Add olive oil and add the sliced potatoes. Fry for 10 minutes until golden (they won’t crisp up much because of the onions but they’ll taste good). Just before serving toss in parsley and season. Rinse the chard and remove the stalks. Chop the stalks coarsely and cut the chard into ribbons, as you would cabbage. Simmer some chopped carrots in a small amount of water and a good knob of butter for about 10 minutes. Add the chard stalks and cook for another 7 minutes. Add the ribbons of chard for the last 3-4 minutes. Season well and drain off any excess liquid.